The “2017 Caring for Cats Calendar” Photo Competition is open to anyone who has ever adopted a rescue cat or kitten from the charity. Share your favourite feline photo and help more rescue cats in Yorkshire & Humber. We are looking for photos of cats of all ages, colours, and sizes and in their most appealing or characteristic poses. Judges will be looking for a mix of indoor and outdoor settings, showing your forever cat at his or her very best. Twelve will be picked to go into the calendar and one to be our fabulous front cover; winners will be chosen by a panel of Trustees and volunteers. The calendars will be published and available for sale in the autumn for £5 to raise much-needed funds for the charity. 1. Photo specifications: High resolution images (over 300 dpi) will be required for print purposes, min 2-3MB file size as a guide, higher preferred. Images which are not high enough resolution/size may have to be discounted. Calendar month pages – all submitted images should be LANDSCAPE. Front cover – all submitted images should be PORTRAIT. 2. Photo composition & quality: Your photo should be in focus with the cat/s as the focal point. You can get your cat to look at the camera by using a squeaky toy or crinkle ball. You should aim for no or few background distractions & avoid clutter in the shot. Images should be well lit, but try and avoid direct sunlight; good natural daytime light gives best results. We regret entries with incomplete information cannot be accepted. 4. 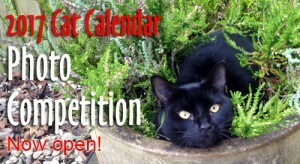 Entrants agree that their photographic competition entries are their own work and may be used freely in the 2017 Caring for Cats Calendar and in other printed and online marketing materials to promote the calendar or charity.